SMHW 2014 is almost here! 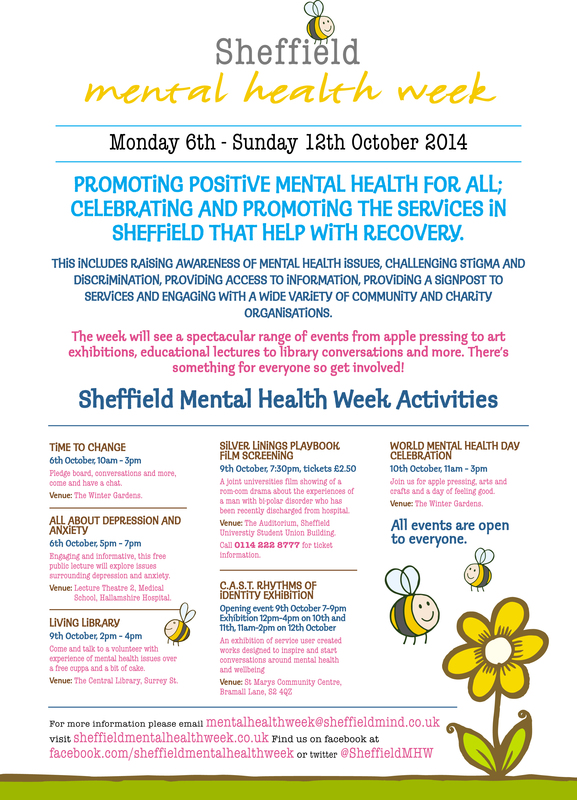 Following the success of our Wellbeing Festival on 18th July, we are excited to be approaching Sheffield Mental Health Week, 2014; aiming to promote positive mental health for all and to celebrate and promote the services in Sheffield that help with recovery. On World Mental Health Day itself (Friday 10th) we’ll be in the beautiful Winter Gardens where SAGE Greenfingers and Artling will be giving us a day of feel good fun. Activities on the day will include pressing apples for the freshest juice imaginable, creating your own card to send to a loved one and having a go at painting some of the Winter Gardens beauty. SAGE and Artling are experts in horticultural and art therapy respectively and their work transforms lives; so come along and see for yourself. The event is free to attend and open to all – bring some apples if you’ve got extra this year! Other events during the week include a wonderful opportunity for artists from the Sheffield Creative Arts Support Team (CAST); their annual exhibition which will be at St Marys Community Centre between 9th and 12th October. The exhibition will include a huge variety of works in different mediums addressing issues of mental health awareness, stigma reduction and starting conversations about mental health. The Time to Change team will be joining us on 6th October at the Winter Gardens starting conversations about mental health in the same week that we are proud to see Sheffield Hallam University signing the Time to Change pledge. To celebrate this they are hosting a film screening of ‘Silver Linings’ on the 9th October; a powerful film about a man suffering with bi-polar disorder. Add to this a public lecture at the Hallamshire hospital on depression and anxiety (6th October) as well as a ‘Living Library’ event at Central Library on 9th October and it’s a packed week. The library will be hosting volunteers with experience of mental health issues to talk with members of the public about their experiences over a free cuppa and a bit of cake. Kevan Taylor, Chief Executive, Sheffield Health & Social Care NHS Foundation Trust, said “Sheffield Mental Health Week always offers a wonderful variety of events and this year is no different. I am very proud that the people of Sheffield come together each year to promote mental health and am particularly looking forward to seeing the latest work from CAST.